When I became a mom, I was very exciting to try my hand at scrapbooking. Unfortunately, reality hit that taking the time and energy to scrapbook with three little ones underfoot wasn’t as easy as I originally planned and my projects are currently collecting dust in the closet. I recently discovered the most creative online store, The Forever Moments that captures all of the important life moments in a beautiful personalized photo gift that is surrounded by a lovely premade scrapbook layout. The Forever Moments has a wonderful selection of customized design layouts for virtually every special occasion or life moment. From new baby, sports, family, sports & hobbies, military, holiday and celebration themes, this is a great way to have a keepsake treasure to enjoy personally or to give as a gift. I created a Christmas Stockings holiday photo layout ($19.99) and I wish that you could actually see it up close. It is visually stunning and it is without a doubt my favorite holiday decoration and a new family treasure that we will enjoy for years to come. I selected a Christmas photo of our family and it is showcased by an amazing display that actually looks like a fireplace mantle. Each Christmas stocking features an individual name and our family name is displayed on the hearth. Our “Christmas Stocking” includes hand cut holly and red and white pearl beads giving it extra depth and dimension. You can purchase your favorite designs with or without a frame although I recommend adding the frame because it is then display ready. It is like a wonderland tribute to our family…..I just love it! Do you have a loved one in the military? 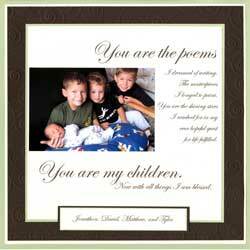 If so, you are definitely going to want to check out the military themed personalized portrait designs. Sports are another popular category that has a wide selection of ideas to celebrate those winning moments for both children and adults. I really like the wedding selections and any of the designs would make such a wonderful gift idea for a new couple. We recently attended a wedding and a guest snapped a picture of us together as a family. We rarely get a nice shot of all of us together with everyone smiling so this family portrait is very special to me. I immediately went to The Forever Moments website and selected a design that would be complimentary for a wall display of our family picture. 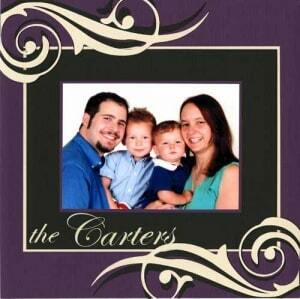 I really like the “Elegant Family” design which I was able to personalize with our last name. 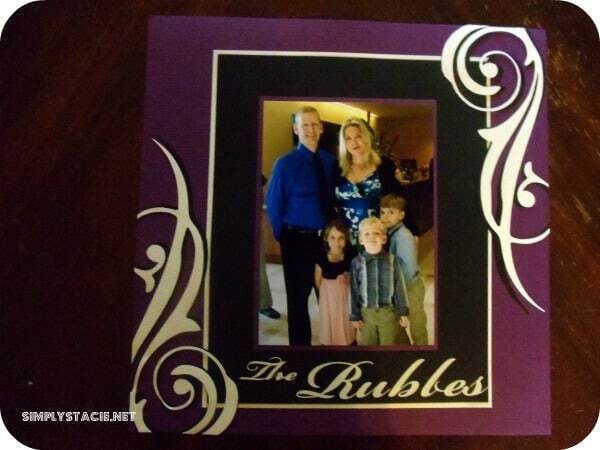 The hand cut iridescent paper really accentuates the photo and the swirls are a lovely accent. You are invited to visit The Forever Moments to browse the entire selection and create your favorites. I am so impressed with the quality and attention to detail. In my opinion the prices are also very affordable and the value is exceptional. Finally……..I can work on reinventing all of those dusty scrapbook ideas and The Forever Moments will “bring it to life” doing all of the work for me! *Simply Stacie readers can receive an exclusive 25% off discount for use at The Forever Moments by using the code “SIMPLY”. I like THE REST OF YOUR LIFE layout. I like the Family Portrait layout. I like the paw print layout. I like the Senior layout. My favorite is My Little Monster. The Paw Print is my favorite! I really like the rest of your life. I think the rest of your life looks nice. I like the Mommy and Me (Green) layout! My favorite is the Paw Print. love the wedding pearls layout, so pretty! I like The Rest of Your Life layout a lot! My favorite is the family portrait layout. i love the birthday girl cupcake! I like the family portrait (elegant) layout. I really like the Christmas Stockings layout.